Hosted by comedian Amir K, with special words from Ovarian Cancer survivor Lynne Wendler. 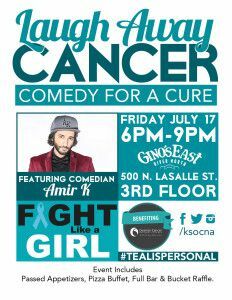 They say laughter is the best medicine… Join The Comedy Bar, and the Ovarian Cancer National Alliance as they “Laugh Away Cancer” with host and headlining comedian Amir K. on Friday, July 17 from 6 – 9 p.m. at The Comedy Bar, located on the third floor of Gino’s East River North (500 N. LaSalle Street). Amir’s comedy is a hilarious blend of character work, storytelling and improvisation shaped by a multi-cultural upbringing, which he will use to now honor the Comedy Bar for a great cause. Each year in the United States, approximately 22,000 women are diagnosed with ovarian cancer and approximately 14,000 pass away from the deadly disease. This fundraiser honors the memory of Karen Schek, mother of the event organizer, who passed away from the disease in 2012. In addition, The Comedy Bar is proud to announce that ovarian cancer survivor and Ovarian Cancer National Alliance advocate, Lynne Wendler, will be on hand to share her personal story and battle with ovarian cancer. The event will also feature a bucket raffle, a hybrid between a regular raffle and a silent auction, in which guests can bid directly on the item they would like to win by placing their raffle ticket straight into that item’s bucket. Participants can purchase five raffle tickets for $50 or 10 tickets for $90. 100 percent of the raffle proceeds will be donated directly to the Ovarian Cancer National Alliance. Tickets to Laugh Away Cancer: Comedy for a Cure can be purchased individually for $50, or in pairs for $90. For more information, to purchase your tickets, or to make a donation to the Karen Schek Remembrance fund for the Ovarian Cancer National Alliance visit their website or call 312.836.0499.